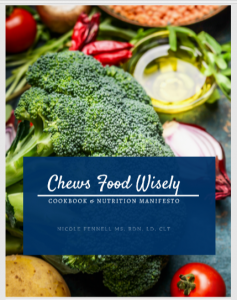 The Chews Food Wisely e-Cookbook and Nutrition Manifesto helps you to set the foundation necessary to make lifelong, healthy habit change. In the first half of the book, Nicole dives deep into nutritional science in a realistic, understandable way to help educate and empower you to make better food choices. She outlines simple ways to optimize your health from within, focusing on healing the gut and natural detoxification.